To eliminate the guesswork out of shopping and product selection process, HeatTech now offers 120V “Kits” at a discount price. Each kit contains a specified size floor heating mat, a 120V programmable floor sensing thermostat and a compatible sensor. 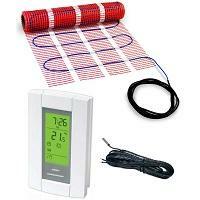 For thermostats with GFCI function, see our mat kits with a letter “B” at the end (such as HTMAT-120-10B).